Once again I am indebted to Pat of Plant yr Yd Coven for sending me a fascinating story and photos to go with it. 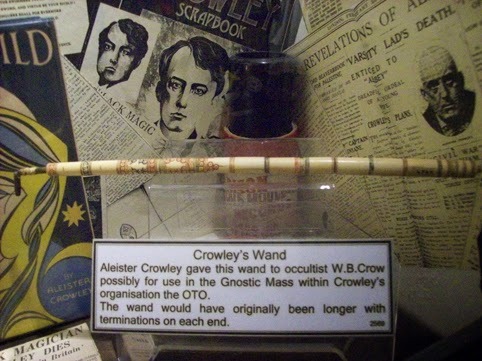 This story relates to Aleister Crowley's wand and the Museum of Witchcraft, in Boscastle, Cornwall. 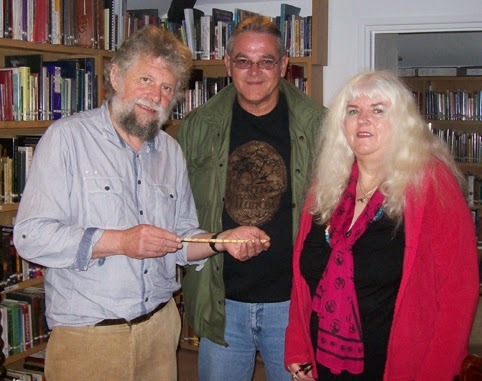 Pat said: "Our High Priestess and myself donated a Wand of Crowleys to the Museum of Witchcraft. She came by it in a roundabout way, and it was, when she obtained it, being used by the children of the lady who owned it at the time, for playing `Harry Potter`*lol*. I have a few pictures of the handover, its now safely ensconced at the Museum of Witchcraft in the Crowley exhibits." Information about the wand from the Museum of Witchcraft says it is made of bone or ivory and states: "A slender wand consisting of a series of cylinders of bone or ivory decorated with black and red bands and circles, and held together by an iron rod through the core. The wand was given to W.B. Crow by Aleister Crowley... Donated to the museum by Helen Richards and Pat Judson, High Priestess and Priest of the Coven of the Ercall Yew Grove in Shropshire." You can see a photo of the handover above and the wand in its case at the museum below. Previous posts that Pat has sent amazing photos and information for include How to Build a Wickerman, Shaft of Light in Bryn Celli Ddu and the Green Witch Festival. Nice. The black and red bands would be from the Golden Dawn and the iron center would be from one of many Solomonic Grimoires. Nice. I would like to reblog this using the picture of the wand in the post and a link to your post. To whom would i ask permission to repost the picture? Thanks for those details about the wand's background. I'll ask Pat if he is OK about the photos being used - I think he will be fine about it, but best to ask.